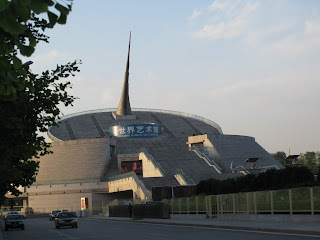 Beijing World Art Musuem - Sigal Bussel. 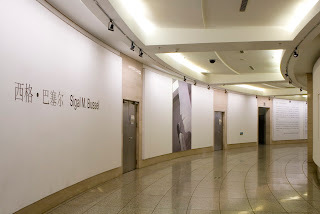 My friend Sigal just had large exhibition of her paintings in one of the largest Modern art musuems of Beijing. She asked me to take some pictures of her for the catalogue- but I was blown away when one of my still photographs of her was blown up and placed on a full wall in a Chinese Modern art musuem. Sigal showed me pictures of Chinese musuem goers taking pictures of my still photograph at the entrance to her exhibition in the Beijing musuem. For a videographer and documentary filmmaker like myself- it was a really interesting experience capturing the essence of a person in one frame. I am used to capturing moving life. So the fact I succeeded in capturing a frozen moment in life was a wonderful experience. That still photograph made it's way to CCTV's website- the website for China's TV station that interviewed Sigal as well. They Zoomed in on the photograph and that looks just as interesting. Sigal's an amazing artist and I hope this exhibit will be one of many to come for her new and powerful collection of paintings titled: HEAD. The rules and conventions of interpersonal relationships are unraveled at an exhibition that opened Sunday. 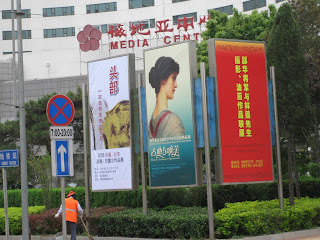 It's at the Art Exhibition Center of Beijing's Millennium Monument. Viewers are guided on an Odyssey of self discovery, through the works of American Artist Sigal Bussel. The sole subject for Sigal Bussel's exhibition is the head - the primary center for control of human activity and the seat of consciousness. The Heads, executed in propylene pigment, face different directions. Other materials, such as ropes, chains, resins, wood chips and sticks complement the works. The exhibition is entitled "Heads: A Voyage of Self Discovery". Bussel says she wanted to examine estrangement in interpersonal relationships - the connections between people and the world around. 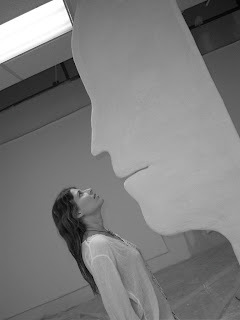 Sigal Bussel, artist, said, "I feel the heads are very symbolic. They express all our emotions, and who we are. Everything is expressed through our facial expressions. And I really want it by removing some of the facial features, to remove our individuality and our differences. I think by removing our differences, then we'll afterwards face the humanity. These heads can be used as a mirror to go through a self-voyage, a self-discovery." Lei Zhengmin, arts critic, said, "The various materials Bussel used in her productions bear different connotations. Seemingly the works are simple and plain but they're actually profound in nature. The Heads are presented as a perfect starting point." Sigal Bussel lives in Los Angeles. Her paintings and sculptures have been showcased many times in her home country and outside. She's had exhibitions at Harvard University where she earned her Master's degree, and at China's Xi'an Modern Art Gallery. The exhibition runs till May 16th.